There are some seriously crafty parents out there, like Lori Danelle who took shipping pallets and transformed them into the cutest toddler bed. So cute, in fact, you might even consider figuring out how to make this into your own adult size bed. Lori took two shipping pallets, cut them and pieced them together to make this eco- and kid-friendly toddler bed and even shares her hints and tips for the DIY project on her blog. We first saw this amazing DIY project over at Design*Sponge as a before and after project and fell in love with Lori’s great sense of style as well as her great use of recycled materials. The toddler bed would make for a super-fun weekend project that would end with your kiddo being super excited about their new “big kid” bed and even a great way to share the DIY and reuse mentality. All you need are a two or three shipping pallets, some bolts and screws, 4 caster wheels, and various tools to cut and sand the pallets down to the right size. Lori gives a pretty good step by step with great photos to explain the process, which could easily be modified to create a larger bed for a regular twin or maybe even your own adult bed. 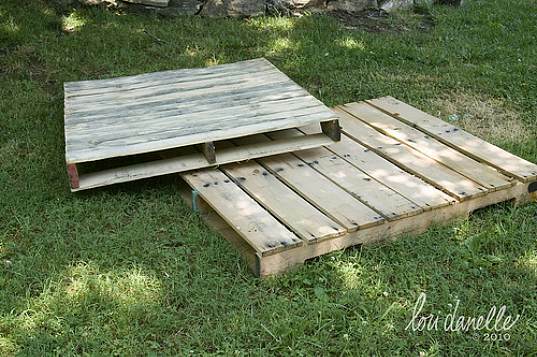 Lori also gives a few good tips about pallets – make sure to look for pallets marked with a “HT” on the side, which stands for Heat Treated, instead of marked with “MB,” which means the wood was treated with chemicals to protect it from insects. Seriously?? I am all for reusing materials but this looks horrible. It would be more at place in a tent city than a child's bedroom. This is taking "shabby chic" a bit too far over the "shabby" edge. That bed scares me because of the potential for staples and nails to work their way through the wood years or months later, and for the MASSIVE amount of bug spray applied to pallets to get them ready for export to the U.S. I'd never want my child sleeping next to that many chemicals. I have to agree that this looks really cool, but does worry me a bit with the bug killers. I'm sure if you sand it and pull out the staples and seal it you could probably get rid of most of the danger, but I'm not sure...we bought our toddler a bed from the antique store for $45 and it works great and is also "reused"! I think it is a great idea and as a woodworker I can tell you that if it is prepared properly you won't have any stapes or nail to worry about. As far as the chemicals I would have to do some research. Yes some pallets come from overseas when things are shipped hear but a lot of the pallets that are around are made in the US. If you are worryed about the chemicals you could always use old barn wood or other types of recycled wood. Great idea thanks Lori. 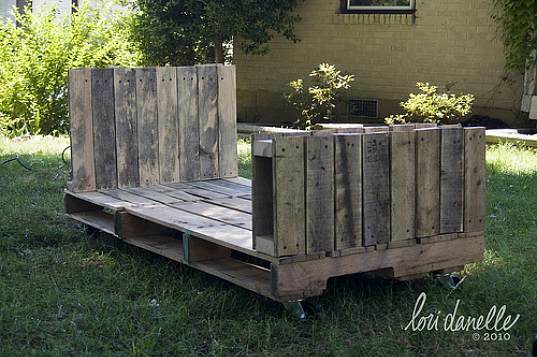 How do you obtain pallets that are good.